I was shocked to find out that Portugal has 300 days of sunshine. This means that it's always warm and evidently also known as Europe's Southern California. West coasters, this honeymoon spot will make you feel right at home. Now ... read on for we have guest writer, Rebecca Brown with us today. Sharing why you need to consider picturesque Portugal for you honeymoon and destination wedding. Picturesque Algarve is Europe’s sunniest wedding and honeymoon destination which will instantly get you in the mood for romance! If you are looking for a picture-perfect and utterly romantic beach location that is off the beaten path, then the Algarve is simply ideal for your destination wedding or honeymoon! Blessed with 3,000 hours of sunshine every year and hundreds of kilometres of awe-inspiring coastline, this is where you can indulge in perfectly cooked freshly caught fish and seafood, enjoy intimate picnics with your toes dipped in warm sand, sip delicious wine and immerse yourselves in the luxury of the historic Pousadas - Portugal’s signature hotels. Not to mention that the Algarve is much more affordable than all those overcrowded, top-rated tourist hotspots across France, Italy, and Spain! Here, you will be spoiled rotten by exquisite customer service, divine food, and wonderful weather, but it won’t overstretch your budget and you will have more privacy. And we promise you will be seduced by the hypnotic sounds of the fado, the mesmerizing taste of sweet Porto and captivating aroma of all the local delicacies! The hotel above is The Conversas de Alpendre. This hidden resort has fantastic ocean views. Just 1.2 miles away and you'll find one of the best beaches in the Algarve. This place exudes calming tranquillity and will provide everything you need for a soothing vacation and it's only $144 a night! What? So good! The Algarve is the southernmost region of Portugal where the tranquil Mediterranean Sea meets the wild Atlantic Ocean. The weather is truly superb precisely because of this! Did you know that this corner of Europe has more sunny days per year than California? Yes, it is a year-round destination with hot summers and warm winters, but the wedding season lasts from March to November – so unless you are planning a white Christmas wedding, the Algarve is for you. The ideal time for a destination wedding or honeymoon is spring and autumn because then the temperatures are pleasant, the colors are vibrant, the sea is warm and the beaches are definitely not jam-packed with people. Schedule your trip for March, April or October and you will get the most of this breath-taking region. 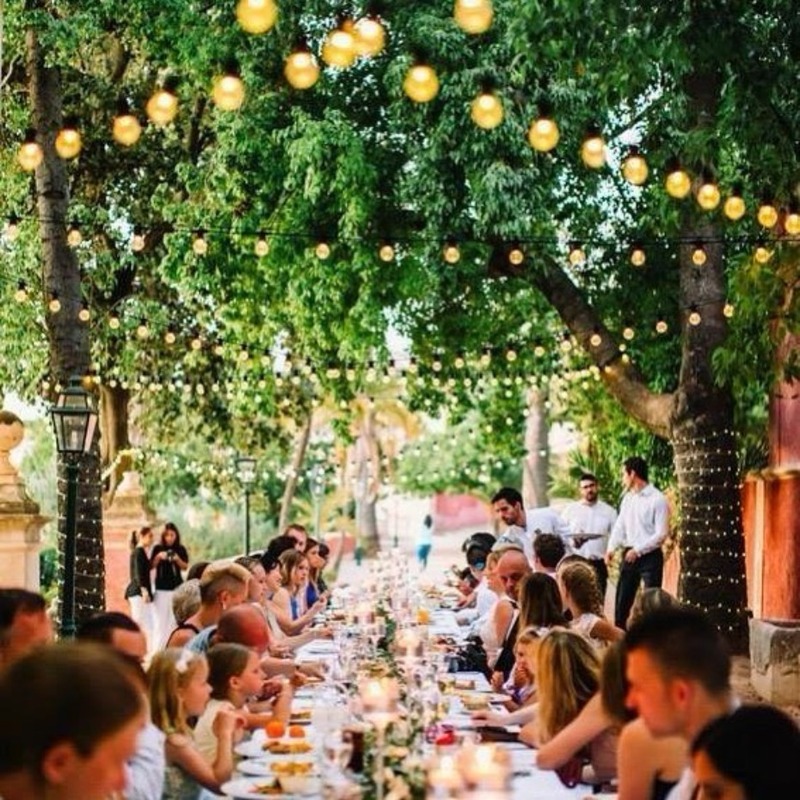 How to Host the Perfect Destination Wedding? Since the Algarve is a relatively new and still underrated wedding destination, you can get really good deals. Many vendors will speak fluent English which will make things easier for you, but we still recommend hiring a professional wedding planner, because they have great contacts and can source the best venues and accommodation at fantastic prices. Packages often include unlimited drinks which are a huge bonus. Your wedding planner will also help you style the venue, sort out flowers, decorations, photographers, wedding transport and everything else you may need to celebrate your big day in style. Most importantly, they will assist you with paperwork which may otherwise cause stress. You don’t need to reside in Portugal prior to your wedding in order to get married there, but you do need a non-impediment certificate which has to be ready six months ahead. Catholic ceremonies are legally binding, but you will have to get married in a church and hire an official translator. Not sure where to tie the knot? Whether you want a hidden venue suitable for an intimate gathering or something undeniably glamorous and over-the-top, you are bound to find a place you will love in enchanting Algarve. You will discover quaint Catholic churches, spectacular beaches, top-notch restaurants with sea-view terraces, lavish private villas and adorable gardens where you can set-up a marquee and soak up grandiose views while enjoying your celebratory meal. A good wedding planner can even dig out some breath-taking but less-known venues you will immediately fall in love with. How to Spend your Honeymoon? Your romantic stay at the Algarve will be a whole new chapter of your love story. The magic of the sun, the sea, Portuguese wine and gourmet delights will stimulate your senses and make you feel even more infatuated! From the Vila Real de Santo António in the east to Southwest Alentejo and Vicentine Coast Natural Park in the west, the coastline is jaw-dropping. It is brimming with pristine sandy beaches which are beautifully embellished with limestone cliffs, caves and archways which create natural shelters from the sun. And here, you will find the sun in abundance during long, hot summers which are ideal for honeymoons. The best way to explore the region? Fly to Lisbon, rent a car and travel all over the Algarve to see its best beaches, eat in the best restaurants and encounter cultural heritage that dates back to 12th century. You can begin your adventure by wandering around postcard-perfect Lisbon because this is a truly endearing historic city where the colors are vivid and the romance is palpable. Once you have caught a glimpse of Portugal’s capital, you will be ready to encounter something even more spectacular. Accommodation-wise, you can find anything that suits your budget from cheap but cute and cozy self-catering apartments to decadent suites in 5-star beach resorts. If you want a uniquely Portuguese experience, find a room at one of the historic buildings such as former palaces, castles and convents restored and transformed into luxury hotels. 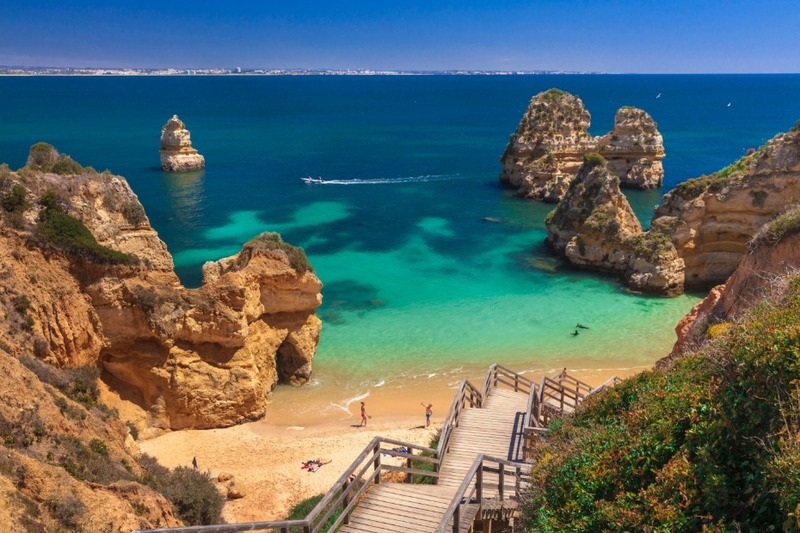 If you want to spice up your honeymoon with a road trip adventure, book into different hotels and discover all the hidden gems of the Algarve. Must-see places include Vilamoura which looks like it was made for newly-wed couples, the bustling city of Portimão, because it is a surfers’ paradise, the iconic Praia Bordeira famed for its rugged limestone cliffs and the charming city of Tavira which will melt your hearts with its old Roman bridge, historic churches, castle ruins and cobblestone streets. 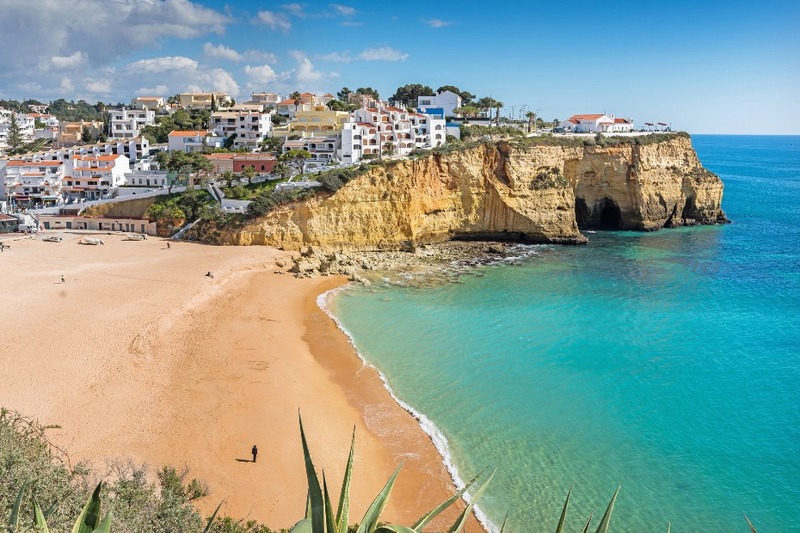 The Algarve has many remote beaches where you can hide from crowds and enjoy a romantic meal for two if you bring a hamper box full of delicious local food and wine! The regional cuisine is brimming with aphrodisiacs such as asparagus, lobsters, clams and other seafood which is always fresh and impeccably prepared. The rolling countryside is perfect for scenic rides and long walks. It is dotted with striking medieval towns which you should visit too! The region also boasts outstanding golf courses, so spend one of your days hitting tees! The famous wine region, Alentejo, is a short ride away, so take a stroll through the vineyards and taste the best whites and reds at rustic quintas! Rebecca Brown is a traveler by night and a translator by day, blogging at rough draft whenever she finds the time. In love with the sea and about to get hitched, she spends time on flights looking for the perfect islands to tie to knot on.